Initially, it did not seem necessary to this writer to discuss the star motif. Too obvious, he thought. While this is possibly true, two versions of the star motif may cause confusion. They should be discussed! These motifs are defined differently by different dealers, collectors, and museum curators. But the basic star motif presents no such problem. It is a simple star, with rays of equal length emanating from a point. It is often called a single star to avoid any possible confusion with the following two motifs as well as with the hobstar and Brunswick-star motifs. 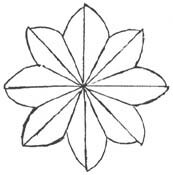 Flashed Star: In this form there is a fan — the sketch, on the right, shows an example with seven-ribbed fans — between each pair of the star’s rays which, themselves, are of equal length. The motif is so named and defined by analogy to the flashed-fan and flashed-hobstar motifs which are similarly constructed. The Pearsons illustrate and define the latter two motifs in their “Terminology” section (Pearson and Pearson 1965, p. 31), and Pearson frequently illustrates and names the flashed star elsewhere (e.g., Pearson 1978, pp. 194-195). The flashed star has incorrectly been called “shooting star, , as well as “Brooklyn star” (Please see (note 1) as well as the dorflinger5.html file in Part 2). Radiating Star: Here the star’s rays are of differing length. The motif has acquired various names over the years, including radiant star and English star (étoile anglaise), the latter appearing in a price list from the Belgian factory Val St. Lambert. The Dorflinger and Hawkes companies, in particular, frequently used the radiating star on the feet of their glasses. It is not clear why some dealers and collectors persist in calling the radiating star a flashed, or flash, star (note 2). The sequence below shows, on the left, an eighteenth century version of the single star, where each ray required two passes of the cutting wheel (slice cutting). This form has also been called a flat star (a name that is also used, incorrectly, by some writers to describe the Brunswick star). The star in the center — also a single star — is cut with a mitered wheel that had become widely used by the early nineteenth century. The subject of our discussion — the radiating star — is on the right. It can be found on the feet of English drinking glasses made as early as the 1850s, according to Wilkinson whose sketches are shown here. 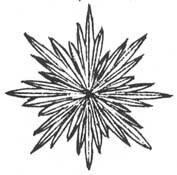 In England this star was known as a “Victorian glory star” (Wilkinson 1968, p. 38). 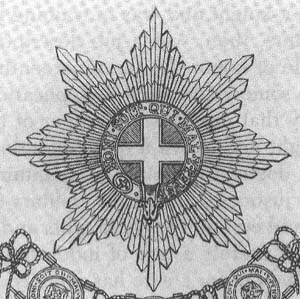 Below is a nineteenth century drawing of the star that accompanies the Order of the Garter, founded in 1348. (The motto surrounding the cross of St. George can be translated as “Evil to him who evil thinks.”) Several of our cut-glass motifs — such as the radiating star — are undoubtedly derived, ultimately, from heraldry, old badges, and ancient symbolism. 1. The flashed star as defined in this file frequently appears on the feet of Dorflinger stemware and on the bottoms of other Dorflinger glassware, especially examples from the company’s early years. It was used throughout the life of the company on the feet of compotes. It is not known what, if any, special name the company may have given to this particular type of star. Other companies, of course, also used the flashed star. Feller incorrectly describes the feet on compotes, punch cups, etc. 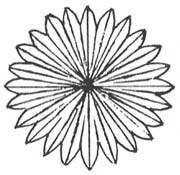 in Dorflinger’s Lincoln service as being cut in a “radiating star design” (The Glass Club Bulletin, No. 155, p. 5). They are actually cut with flashed stars. 2. One reason may be the appearance of the term “flash star” in Revi (1965, pp. 278, 280) and in some of the captions in Feller’s book on C. Dorflinger & Sons (1988, e.g., pp. 201, 213). Revi lists Flash Star as a Dorflinger catalog pattern, but illustrates it only as a cutting on a glass’s foot where it is seen to actually be a radiating star. Feller is more ambivalent. While his illustrated examples also show radiating stars, a comment in Glass Collector’s Digest (Vol. 2, No. 4, p. 23) that refers to a “flashed or radiating star” — when taken in context — clearly indicates that he considers that the two terms, flashed star and radiating star, are synonymous. They are not (see note 1). In DORFLINGER LINE DRAWINGS (pp. 143-4) the expressions “star bottom” and “star foot” are used to indicate either a radiating star or a single star. There are no references to the term “flashed star.” This motif, nevertheless, appears on the feet, or bottoms, of some patterns that are illustrated (e.g., Mayflower, Duchess) and as part of the pattern of some others (e.g., Cactus, No. 3). In no illustration is the flashed-star motif named.